Firefly may not be an excellent game, but it’s hard to deny it’s absolutely dripping with love for the Firefly ‘verse. That might be enough to convince you to play, and if it is then you won’t resent the time you invest. We gave it three stars in our review. But can you play the gorram thing? Let’s find out! FULL BURN! There is only one place where colour is the only identifier. Every card, every token, and and every piece of money has distinguishing marks you can use to identify them regardless of category of colour blindness. However, the area where the issue manifests itself is definitely problematic. 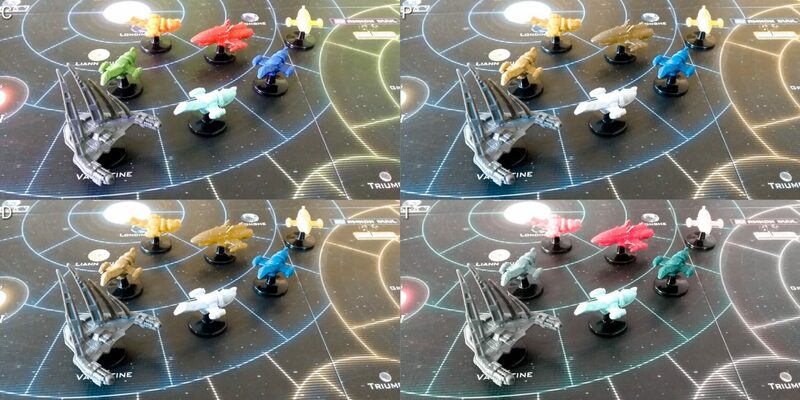 The Firefly models available here fall considerably short of what would be required for a suitable colour palette. Just clean out of quotes. How important are the tokens in a game? Usually, not very. These ones though – they’re absolutely integral. 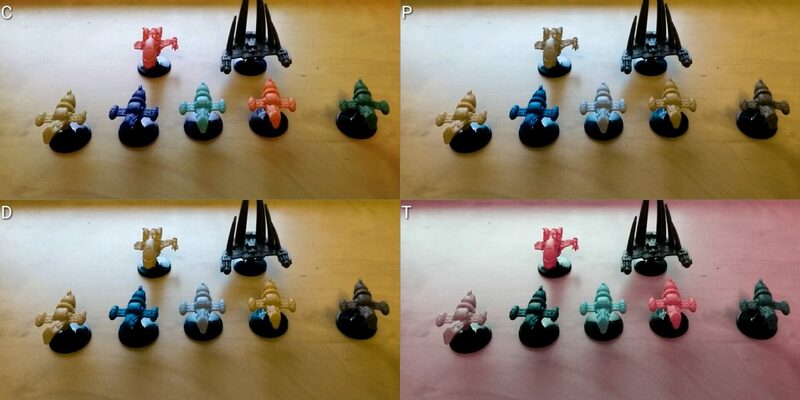 If there is only one kind of colour blindness present at the table, you’ll be able to get a four player game going by avoiding the overlapping colours. If there are more kinds present, then it’ll be harder to do. It’s for this reason that we’re only going to tentatively recommend it in this category. The largest problem with the game from the perspective of visual accessibility is the paper money. It’s all the same size, has no tactile indicators on it, and is difficult to manipulate and separate. Paper money in games is always a problem for these reasons, and it doesn’t even really matter how good it looks. The art in Firefly is great throughout, but if you can’t make out the values of the currency it’s better not to have it at all. Of course, all the usual techniques for dealing with blind-unfriendly paper money are applicable here, but really – you shouldn’t have to worry about any of that. Browncoat… something. I’m so sorry. You don’t lose any key information, but it’s still a bit of a shame. Certain tokens too are very small, and are double sided to show legality or illegality, meaning you need to be able to make out what they are and flip them where appropriate. The small font and poor contrast on some of these is a problem generally, but it’s a particular problem with parts and fuel which are half-sized and very difficult to differentiate if visual acuity is limited. They are colour coded, which is good, but for some categories of impairment this may not be sufficient in and of itself. This is especially true if trying to ascertain the state of the ships others may be flying – to know what fuel and parts they’re likely to have, and in the process make an educated guess about their potential destinations. Tactile differentiation is not strongly enforced in the token design either – you can’t discriminate between cargo and passengers by touch, or between fuel and parts. You can tell the difference between the Alliance cruiser, the Reaper cutter, and the Firefly ships – but you can’t tell the difference between individual Firefly class models by feel alone. Finally, the gameplay area is massive – a six fold board flanked by many piles of cards, and discard piles. Some gameplay decisions will hinge on whether or not you want to visit a particular planet for supply or work, and the cards to check its value as a destination may well be at the other side of the table. It’s hard to keep the game state tidy – this is what it looks like at the end of a game. There are positive elements though – for the most part the font sizes are reasonable, and the contrast as a whole isn’t generally bad. However, the poor accessibility of the rest of it outweighs this reasonably faint praise. We cannot recommend Firefly in this category. ‘What’s Yours is Mine’ gets you paid after you misbehave, as does the ‘Postman Only Rung Once’. For the ‘Slave Grab’, we don’t get paid for successfully misbehaving, we get paid after we visit the drop off point and then negotiate. 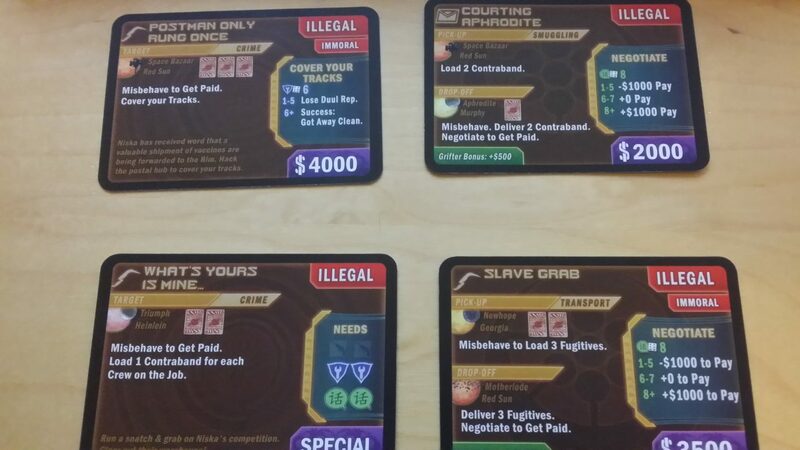 For ‘Slave Grab’, we misbehave to load fugitives. For ‘Courting Aphrodite’, we load without a check and then misbehave to deliver them. Even then the effects can sometimes be needlessly opaque – +$0 pay makes perfect sense to, for example, a software engineer. Adding zero dollars is a weird concept for normal people. There are only four actions to choose from when taking your turn, and you get to pick two before play moves on to the next player. Each of those four actions though are broken down into sub-actions. Mosey versus full burn, for example. This is another incident of two terms which are as thematic as the grave but not particularly accessible. Some of those sub-actions have conditional mini-actions associated with them. 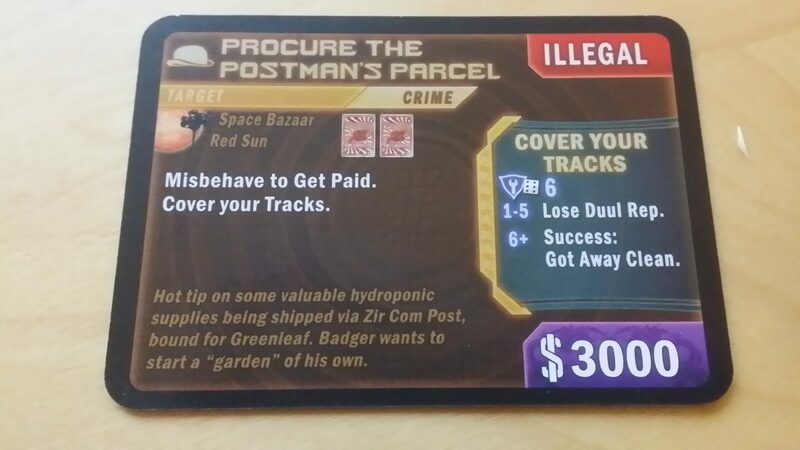 If you’re Solid with a contact, for example, you can sell cargo and contraband as part of a consider action, or if you consider goods at a supply planet you can also buy fuel and parts at the same time. Moving full burn through a system is requisite on the encounter deck letting you do so, and your progress may be impeded without fully carrying out the intended action. This may leave you with limited opportunities for a followup – in essence, some turns you have two actions and others you have a bit of one action. If you’re in an empty square of the map there isn’t much you can do. If you’re in a square with an anonymous planet, you can ‘make work’ for $200 – but all of that must be remembered and dealt with. All of this is also set against a rule-book which can be frustratingly imprecise or silent on how particular combinations of things should be resolved. The nature of jobs too requires some reasonably complex compound strategising – you need to know what equipment and crew you need, and know how to make it happen. Each of the supply decks has a different ‘flavour’ of goods you’ll get from it, and you need to know what location serves which need to maximise your chance of getting what you want. You go to the Space Bazaar for the best chance at crew, and the Osiris shipworks for the best chance of ship upgrades. Similarly with Contacts – they each give a different blend and type of jobs, and if you want to play according to your best prospects you need to know which contact is going to give you the right work. If you’ve got a highly moral crew, you won’t want to be going to Niska with his predilection for the illegal and the immoral. We strongly suggest that those with cognitive impairments stay away from Firefly. None of the rules are especially complex by themselves, but there are a large number of different things that need to be taken into account. The malleability of game flow and the lack of clarity on edge-cases in the rules make it difficult to aim for a consistent playing experience. Firefly makes a big deal out of the dangers posed by the Alliance and the Reavers, but in the end it’s reasonably easy to stay out of their way most of the time. 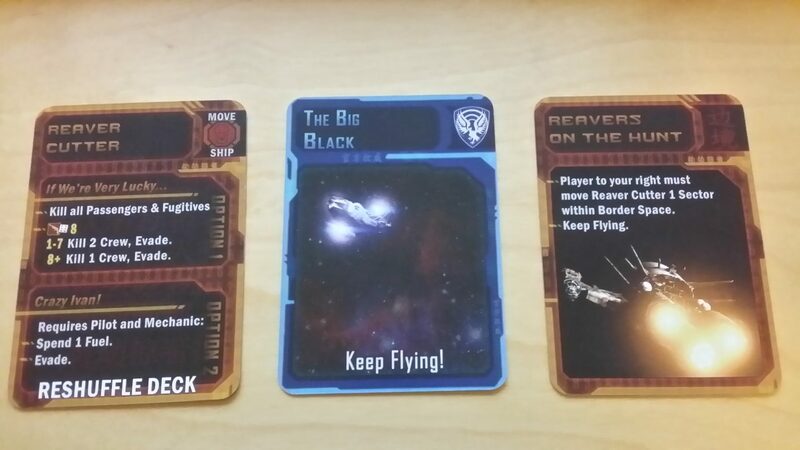 Each encounter deck contains a ‘move the X ship to your location’ card, but it’s only one card in a large deck and in any case the impact is not especially significant. Really, the game is surprisingly easy across the board, and as such challenge is not a likely vector of emotional impact. You’re unlikely at any point to seriously lose significant amounts of game progress unless you’re very fool hardly or push your luck too hard. Your fate is rarely arbitrarily inflicted upon you, it’s always the result of your own actions. Similarly, there is very little player to player interaction to worry about – there’s no combat, no piracy (in the base game), and the only contention is over what’s visible in discard piles. The only place this isn’t true is in the disgruntlement mechanic. If you encounter a ship on the map that contains a disgruntled crew member, you can hire that member away to your own crew. However, you need to go out of your way to inflict disgruntlement in the first place (not paying crew, or undertaking immoral missions with moral crew members on board), and you need to actually meet up with another ship for it to be possible. Crew members are not in short supply across the game, and unless you want a specific crew member someone else has there are easier and more convenient ways to make it happen. So, this is a possible source of emotional upset, but not one that’s likely to come up too often. Score isn’t handled particularly quantitatively in the game – you get a goal token when you meet a specific goal, and you win when you meet the scenario goals. In that respect, you either win or you lose – there are no score disparities to worry about unless you want to specifically count up how far away people were from either of the tokens. The only thing that may be an issue in this category is in the nature of some of the jobs. There are jobs that involve kidnapping, pushing drugs, slave trading, and more. Some of these come from the Alliance, ostensibly the voice of law and order in the ‘verse. There are forced re-settlements and diverted medical shipments and more. None of it is gratuitous, and all of the action happens inside your head. However, for those that may feel disquiet for potentially engaging in acts of sanctioned (or unsanctioned) cruelty there may be an issue of triggering content. I don’t think the risk is particularly high, but it’s there. We recommend Firefly in this category. It’s not a good story here. First of all, the paper money is difficult to work with – it clumps together, doesn’t separate cleanly, and generally serves to be more trouble than it’s worth for all players. The problems this causes are multiplied for those with physical accessibility issues. Every financial transaction in the game is like trying to force open a fresh plastic carrier bag while in a hurry. While a queue of disgruntled shoppers tut and tsk at you. We’d thoroughly recommend making use of – well – any other currency for the game. We’ll come back to this when we talk about intersectional issues. The cards are of standard poker deck size, and of reasonably good stock. You rarely need to do a lot of significant in-hand management because the cards are played face up in front of you. There’s no requirement to move the cards around to indicate crew/equipment allocation to jobs, although it does make sure that the rules for these are properly obeyed. When considering cards, you only ever have three (or perhaps four) to worry about at a time. While there are a lot of cards, there’s not a lot of card manipulation. It’s mostly drawing and discarding as needed. The main exception is when you upgrade your ship, when the card is slotted into the appropriate place under the ship card. Unfortunately, that’s not true for most of the other tokens in the game. 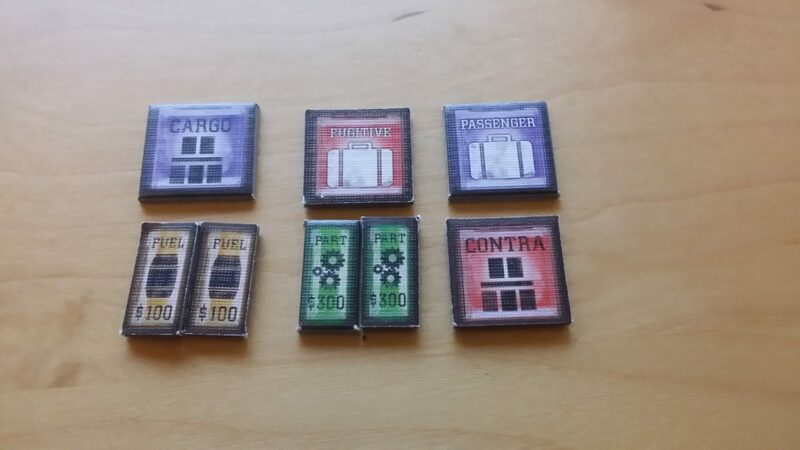 Parts and fuel are loaded and unloaded constantly, and the tokens are incredibly small. The cargo hold of your firefly is large enough to fit two parts per slot, but that’ll require some fine-positioning to put things where they should be. Cargo and passengers are larger, but still not so large that they won’t require some reasonably precise motor control to place in the ship. As usual, someone can actually do the physical interaction on someone else’s behalf here, but we prefer games that permit agency where it is possible. A significant issue is the size and scale of the board, and the sheer number of different locations where things happen. The game benefits considerably from being able to move around it, and lean over it to make moves. You’ll almost certainly be asking other players to move for you regardless of your physical needs because it can be exhausting reaching over for everything. In that respect, everyone is likely to be in the same boat. The game offers considerable opportunity for verbalising of instruction though, and the fact that everything is played face up for the most part means that there’s no game impact of other players helping out with movement, cargo management, and the collection and discarding of cards when appropriate. We tentatively recommend Firefly in this category, with the following provisos – that you make use of some other form of in-game currency instead of the paper money, and that you have another player at the table that would be willing to make physically difficult moves on your behalf. The game doesn’t require anything in the way of communication, but it does require the ability to read and understand English in what is sometimes a very tortuous syntactic structure. It relies heavily on antiquated idioms and makes considerable use of flavour text throughout to construct the theme. We wouldn’t recommend it for anyone that doesn’t speak the language of the game version to a reasonably fluent level, but we’d recommend it to everyone else. While opinions differ on Joss Whedon’s portrayal of women and his credentials as a ‘good enough feminist‘, I’ve always thought his work is striking for the way it plays with and subverts traditional stereotypes of women. Buffy took the standard ‘handsome man saves the pretty girl from monsters’ trope and turned it on its head. I think Firefly has a large number of very strong characters representing a wide variety of gender and ethnic intersections. True, ‘strong’ in this respect tends to mean a rather limited interpretation of strength as ‘tough warrior’ across most of his shows. Within Firefly though you have characters as varied as Zoe, Kaylee, Inara, River and Saffron that straddle a wide spectrum of strength, expertise, wisdom, charm and self-possessed ambitions. It’s not perfect, sure – but the fact that there’s a meaningful and lively debate over what these portrayals actually mean is encouraging. Firefly is also a universe where inter-nationality has become embedded into the culture of the show – the evolution of the technology and aesthetics of the franchise is one determined by a cross-cultural Sino-American alliance. Most characters speak English and Mandarin, and freely swap between the two. My view is that at least in this respect, the Firefly TV show gets a clear and easy pass. The board game takes a lot of this on board, making free use of Asian influence in the artwork across the game, from the money to the card backs. However, while the game decks do show a fair number of different ethnic representations, there aren’t a huge number of them and they’re all relegated to crew status. There is one woman in the captain deck and the rest are ‘rugged white men’. Many of the characters in the crew deck don’t even have names – they’re just ‘scrapper’ or ‘enforcer’. They didn’t have names on the TV show, sure – but why not at least give them names for the game if they’re crew you can hire? Still, there’s a reasonable range of different kinds of people represented in the deck, and that’s pretty good even if it could have been better. There are some elements of troubling theme as outlined above in the emotiveness section, but there’s also a general undercurrent of crime and misbehaviour that’s core to the game. If you were looking for a game to play with children, you might have some ‘splaining to do about why it’s okay to be stealing from the rich to give to the… well, I guess to give to people in exchange for fuel. 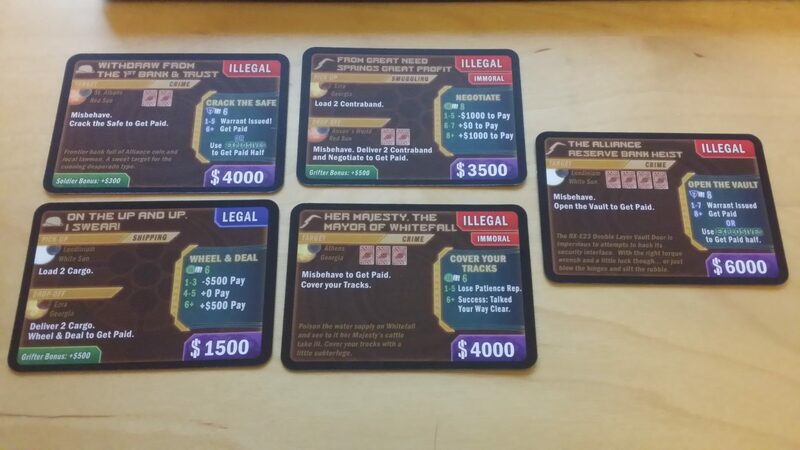 The game makes an interesting differentiation between ‘illegal’ and ‘immoral’ which is an area of interesting philosophical debate, but whether or not that’s a discussion you want to have at the table may influence its suitability. Cost wise, it retails at a robust £40, but you do get a lot for your money. Too much, in fact. Perhaps the most valuable thing about Firefly from that perspective is how well it scales up and down in terms of player count – you can accommodate a single solo player, or as many as five people at a time. It’s also a reasonably lengthy game that gives you a lot of bang for your buck. We recommend it in this category. Paper money is horrible. It causes all kinds of accessibility problems, and even if it didn’t it’s just annoying to work with. Real paper currency isn’t just a sheet of printed paper – it consists of all kinds of polymers, autonomous nanobots and advanced memory-shaped alien alloys that ensure it’s pleasant to manipulate. Board game money doesn’t have any of that. It sticks together, it’s difficult to keep track of, and it takes up way, way too much space. We recommend using *any* other currency, but here we encounter an intersectional issue – the currency that is best for a player with physical impairments (poker chips, say) are not going to be the best options for those with visual impairments. Ideally you need something large and chunky enough that physical accessibility is maximised, and tactile enough for visual accessibility to be maximised. In the end, you’re probably going to come down to using some denominations of actual money or the like. But seriously, as nice as the paper money looks, it’s a pain in the backside to manipulate. The size of the board creates intersectional issues for those with visual and physical impairments – there are a lot of decks that need inspected, and if you can’t get close enough to them to examine the stack and the discard pile then it’s going to have to be passed to you for examination. You may be weighing your choices between ten possible destinations, and that can be a lot of passing and passing back if you can’t orbit the board yourself. 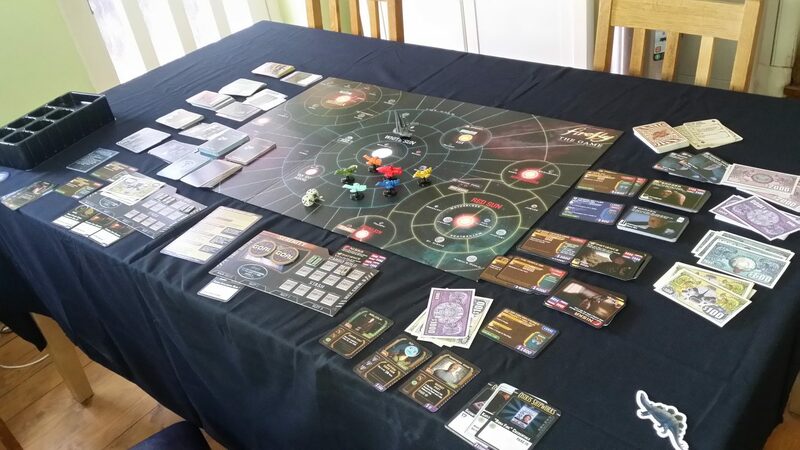 Firefly is a long game – I’d estimate an hour per player for any given scenario. While people will get quicker with practise you also need to take into account the impact that accessibility compensation will bring about. In other words, it’s exactly the kind of game where you need to worry about physical or cognitive distress becoming an issue. You need to set aside a meaningful part of an evening to play this. Luckily, it’s a trivial matter for a player to temporarily drop in or out. There’s virtually no interaction between players. If a player is no longer flying their ship it can simply be left where it is. If the drop-out turns out to be permanent the goods and cards on the ship can be redistributed back to their various decks. The game works as a solo game, although it requires a special scenario – dropping from two players to a single player may require some creative house-ruling. Any other number of players dropping out can be handled without real game impact. Positioning of tokens on the ship cards can be difficult for those with physical or visual impairment, but especially difficult for those with both. Again, the tiny tokens here cause a significant problem for which players must compensate. Moving the Firefly around the ‘verse on the other hand is relatively easy – the spaces on the map are quite generously proportioned, and fine positioning is not required. For those with physical and communication impairments, offering meaningful verbalisation of instruction may be extremely difficult. The final intersectional issue is that the emphasis on symbolism on the cards may be difficult for those with visual *and* cognitive impairments. The symbolic language is not especially complex, relating primarily to skill types and dice rolls, but there are other symbols that must be understood. Some crew members are ‘wanted’ for example. Also, some pieces of equipment have multiple options that come with different symbolic language depending on how you want to use them. There isn’t a lot of complicated symbolism, but there is some. So, how did Firefly do in the end? Accessibility and inclusion – the situation is always… fluid. Is that fluid a puddle of piss refusing to pay us our wage? Or do we instead have a box full of Big Damn Heroes? Any one you walk away from, right? Firefly has some serious accessibility problems, primarily caused by a lack of generosity in dimensions, a disregard for colour palettes, and the paper money it forces on us. But it’s also got a number of areas where it does rather well. We couldn’t recommend it for those with visual or cognitive impairments, and we’re very tentative about our recommendation for those with physical impairments. If you have someone that can help you play, it’s shiny – otherwise, no – stay well clear of the gorram thing. 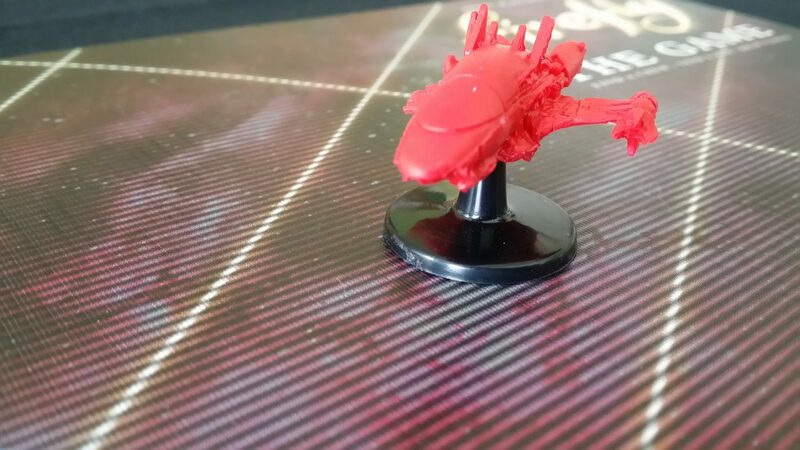 But Firefly is such a rich invocation of the ‘verse that you might very well be keen on picking it up despite it being a relatively mediocre game at its core. You’ll be driven by love – love keeps a game on the table when she oughta fall down, tells you she’s hurtin’ before she keens. Makes her a home. If you love Firefly, and if you think you can play the game, it might be worth taking a chance on it.